We share this information, and testimony with the hope and prayer, that these pages will help all who read, to search and understand the dangers inherent within the eastern philosophies and the practice of the martial arts. And their role in the final apostasy of the last days. Spiritualism is taking the world like a flood, and the final manifestation of the fallen ones is verily just before us. The link below takes you to an article revealing the secret powers working behind the veil in these mystical arts. http://secretdangersofmartialarts.wordpress.com/ – New updated article ! The original article is 7 pages in length, and at the bottom of each page there is a link which will let you continue to the following pages. We are working on the 7th final page even now, and also a new extended edition book. With your prayers, and the grace* of the LORD God, we plan to have it ready to release early 2016. Below is a link to find out more information on this film ministry, as well as the book release. CLICK HERE – to watch or digitally download the full HD series. The Dragon Revealed is now available in a 2 disc set, from Little Light Studios. Please follow the link below to order the full set for yourself, your family or church. To contact Isaiah Ministries and find out more information about scheduling a seminar or speaking engagement for your school, church, congregation or study group, please use the link below. Little Light Studios and Isaiah Ministries extend our deepest thanks to every brother and sister in Christ Jesus who has lifted us, and this film project in their prayers. And we Praise the LORD God Almighty (Yehuwah El’ Shaddai), through Whom all things are possible . . . . for every gift which has been given from the hearts of His children, who were able to help support the work in making this film a reality, and available for all to see ! As our gift in return, we are making the first disc of “The Dragon Revealed,” available to all online for FREE. We encourage you to share this true story of the love and power of the Lord Jesus Christ with all you can. It is our earnest prayer, that through this 2 disc film set, millions of souls will be won to Christ, and prepared for His soon return in the clouds of glory ! Those who wish to purchase “The Dragon Revealed !” in it’s entirety will be sent both disc.1 & disc.2 when they order the film at the link above. Please continue to lift us and the men at Little Light Studios in your prayers as we are completing the manuscript and editing, for an expanded edition of the new book. And may the LORD Bless and keep you and those you love, through His mighty power, and the unfailing Promise (Oath) of His Life-giving Word ! We are also including a link at the “Secret Dangers . . .” site, on the background of the writer, to help those who read to know from what experience he speaks. It is our prayer that as you read this article, you will do so with the Blessing of the LORD God Almighty. May His Holy Spirit guide you into all Truth, and may His holy angels who excel in strength, defend and deliver you from all the powers of darkness ! We are in the final stages of a brand new documentary on the martial arts and Christianity. We have been working on this project for the last 4 years with Little Light Studios, and the film is scheduled for release this summer ! Here is the link for more information on The Dragon Revealed, and how you can help us to make this film available to millions who are still struggling in darkness . . . . and searching for hope, Truth and the Light ! We also highly recommend this new book, “Exposing the Dangers of Martial Arts & Yoga,” by former five-time USA National Karate Champion, Dr. Vito Rallo. Now a born again Christian, and minister of the Gospel, Vito travels around the world sharing the good news of Salvation and Freedom through the shed blood of the Lord Jesus Christ. May the preview of his book both inspire you, and draw you to a more full surrender of your life and family to Christ. Click here to contact Vito at Free Indeed Ministries, and receive your own copy of this powerful expose’ ! We also recommend this powerful book, to those who desire to understand and win the spiritual battles which face every Christian today. So many Christians are living defeated lives in the battle against sin. And this is not the LORD’s will for any of us ! It is vital that we each know by experience that Jesus “Came to set the captives free !” This book gives an excellent foundation for understanding Victory and how it can be obtained through our Lord Jesus Christ. Subjects such as generational curses, strongholds, ungodly soul-ties, sexual sins, occult doorways, praying in faith for freedom, and recognizing your place in Christ are explained from Scripture ! So are you telling me their is no type of self defence or fighting style/system that has nothing to do with budism or serving other so called gods and/or the demonic? I used to practice kung-fu and other martial arts. I was just a beginner but I stopped because I couldn’t afford the classes. I know that many martial arts can be spiritual and spiritualistic. What is the balance? Are there any safe martial arts that are not spiritualistic in nature that a person can practice? Is there a martial art out there that is effective in both teaching offense and defense without having to practice meditation or any type of spiritualism in order to be good at it? Please share your thoughts on this. I sincerely desire the truth to these questions. Thank you and God bless. It is a pleasure to meet you, and look forward to that soon day when we shall met face to face at our Saviour’s return in the clouds of heaven ! In answer to your question . . . All martial arts are “spiritually based,” for they have been developed under the “in-spiriation” of either the LORD God or that of the spirits of darkness. For thousands of years military and police forces have been trained in combative techniques in order to maintain law and order and preserve the lives of the innocent. But it was only after WWII that the eastern fighting arts became well known here in the west. Today, we are seeing these eastern pagan practices, with their philosophy of yin/yang being introduced into almost every facet of our society. And it is through these pagan arts, that the Devil is whispering his lies and causing men to doubt the spoken and written Word of Almighty God. And here is where the greatest danger lies, for once Satan has introduced his shadow of doubt, he knows that without strong unwavering faith the Christian becomes helpless, and without power to combat the very real spiritual battles that we must face every day of our lives. and the unfailing power of His Life-giving Word ! This articles are full of half lies and myths. Karate, for example, is divorced from religion, some Senseis of course can give his influences, but the art itself doesnt. The author is not very well informed and keep spreading lies, like for example explaining that Sensei has anything to do with reincarnation lol. I honestly doubt the author was a real martial artist and just had pseudo instructors, or maybe he was in a sect, some Sensei or Sabunims like to mix their religion with their art. Don’t tell me the karate in the olympics is full of “satanism” or Taekwondo lol it’s just sport and an art. i really appreciate your ministry ,d insight God gives is amazing.remain rapturable. Can you send us an email to our ministry address below. Thank you and may the LORD God bless and keep you ! Violence is still a sin, as even in the most righteous war for self-defense. for spiritually fattening the devil and his minions. Regarding the latter, there are gymnastics for breathing exercises too outside of it. Unless we all practice yoga without knowing it everytime we breathe. And when don’t we ? Well, anyone can proclaim himself a Christian. the church they go to calls itself “Disciples Of Christ Church”. Just that MMA Christians have to look twice at the master they serve with that kind of service, to see if He Is The One they say they do. at comprehensivechristian.com, unfortunately it’s temporarily unavailable. forgetting that the devil, from whom he got his prowess, as the great dragon doesn’t have love to spare for anyone but himself. until his ignominious death at 33 (!). Another of the devil’s wicked ironies ! Those who worship the devil for favors must remember that he’s a cruel & enviously mean master who hates to see his minions flaunting the powers received from him. And LOVE Cannot love Itself. 3/ THE HOLY SPIRIT, WHO IS THEIR Relationship Of LOVE. GOD BLESS you brothers for your Stand. This is about selling DVD’s. You can separate the spiritual from the physical in Martial Arts.I am a martial arts and from the little bit of video online by this group is slanting the martial arts to reflex their agenda. Be fair. The group making these DVD’s just wants to sell you their products. 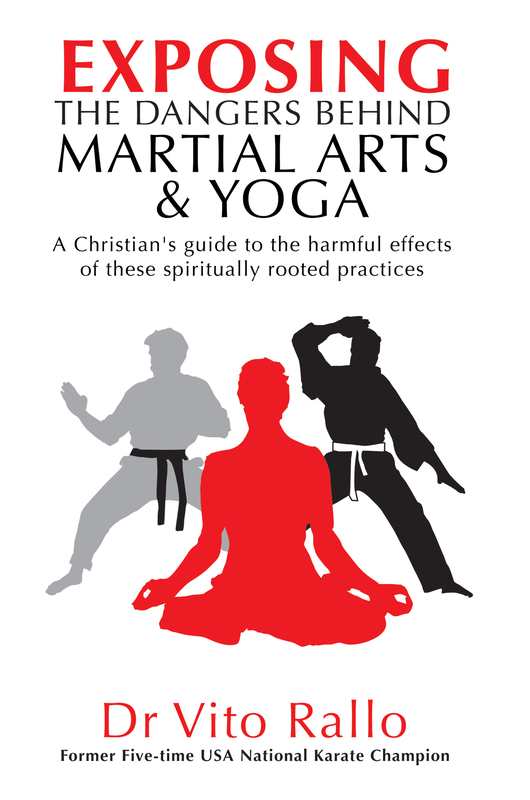 With all the new age practices coming into the church you would think this group would be more concerned with the Seeker Sensitive Church, Sozo and Soaking then martial arts. If you pick on one pick on them all or none at all. Be fair and truthful. The purpose of sharing this testimony is not about “selling” dvds. We spent more than 4 years making this 2 part film, and have made the 1st disc available for free to all, so that many souls will be won from darkness to Light, and faith in Christ Jesus ! We offer both the first as well as the longer second disc to those who would like greater revelation of the spiritual dangers behind these eastern art forms. And the only reason we ask a small price for the 2 disc set is so that through this means the ministry and work of the LORD may be continued. As your brother in Christ, I encourage you to read prayerfully the full article which is included in the link above, called “The Secret Dangers of Martial Arts.” This article will help to answer many questions that a child of God may yet have. And I agree, these other heresies entering the church must be addressed and exposed. And we pray that men of God will take their stand for Truth, and sound the warning while there is still time. Please feel free to write to me after you complete the article if you have any questions. For I also was in these arts for more than 24 years, before the Lord Jesus Christ opened my eyes and set me free ! May the LORD bless and keep you, may He lead and guide you as you seek His will, and Light and Truth !